How Clean is That Refrigerator of Yours? The invention of mechanical refrigeration was one of the most important developments in the history of keeping food safe (others include the pasteurization of milk and commercial canning). Ask anyone who has suffered through the aftermath of a hurricane or ice storm without the benefit of electricity to keep their food cold. But even a plugged-in fridge, humming along and doing its job, can be a place that harbors pathogens that cause foodborne illness or spoilage organisms that result in food waste. A little microbiology lesson might be helpful before we go on. When talking about food, food safety and safe food storage, we often discuss the microbes that can cause foodborne illness. Especially we talk about how to prevent or eliminate them from our food or food preparation areas. The foodborne microorganisms that cause illness are called pathogens. Certain strains of bacteria such as Salmonella, E. coli, Listeria, and Staphylococcus are pathogens—they can cause foodborne illness. Some viruses and parasites can be the source of foodborne illness as well. Other microorganisms may cause food to spoil. Spoilage organisms are generally not pathogenic. Spoilage makes food unappetizing, so we are unlikely to eat it. But the slimy, discolored, smelly, or fermented foods that result from the action of spoilage organisms are not as apt to make us sick, though some molds produce toxins that do have serious health effects. The “good” thing about spoilage organisms is that they tell us that they are there. They make food smell funny or look weird. They turn food odd colors (cottage cheese that looks pink) or make things fizzy (juice that is fermented). We know it is best not to eat them. Spoilage organisms, will grow or multiply quite well at colder temperatures. This is why milk can spoil, juice can ferment and cheese or fruit can get moldy in your refrigerator. On the other hand, pathogens are quiet, invisible. 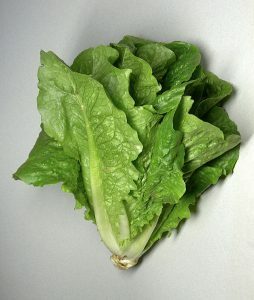 We never know for sure if they are lurking in the lettuce or hanging out on the chicken. Therefore we must take special care to prevent their growth or their spread to other foods or food-contact surfaces. We must assume that they are always there and do our best to control them. Generally speaking, pathogens do not grow well in refrigerator temperatures. They prefer what we call the “danger zone” of approximately 41 degrees F to 135 degrees F. This is why it is recommended that you keep your refrigerator temperature at no more than 40 degrees F. If E. coli, Salmonella or other pathogens contaminate your food before you refrigerate it, these microbes will remain on the food. Refrigeration does not kill them, though it does limit their growth. One exception to this is Listeria. This bacteria actually likes the cold and can grow in temperatures as low as 32-45 degrees F.
The best way to keep your refrigerator from being the source of a bout with foodborne illness is to keep it clean. A 2013 study of home kitchen environments conducted by the NSF, an organization that sets standards for cleanability of commercial food equipment, found that two of the “germiest” areas in the kitchen were the meat and vegetable bins in the home refrigerator. They found Salmonella, Listeria, E. coli, yeast, and mold. Prevention of messes is the first step to a clean refrigerator. When storing raw meat, poultry, or fish, be sure to separate them from other foods. Store them in a way that prevents juices from contaminating other foods or refrigerator shelves—place them on a plate or tray. 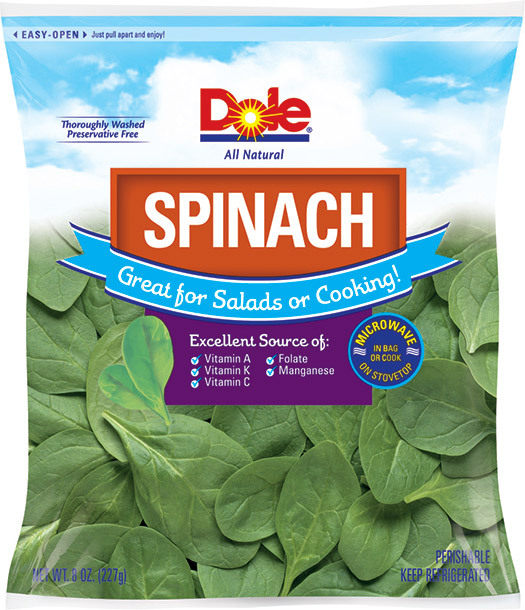 Store fresh raw fruits or vegetables loosely in plastic bags or storage containers. Often it makes sense not to wash fresh produce until you are ready to use it, so it is especially important to keep fresh produce in the fruit and vegetable bin if possible. Keep eggs in their original carton. Leftovers should be refrigerated in closed containers, date labeled, so that they are used before spoilage organisms set up shop. If you have a leaky milk carton, put a plate under it. If spills do occur, wipe them up immediately. If meat, poultry or fish juices contaminate a ready to eat food (lettuce, cut fruit, cheese), it is best to toss it. A least weekly—maybe the night before garbage pickup–go through your fridge and throw out any perishable foods that are past their prime. Check dates on milk, yogurt and soft cheeses. They generally are best if used by 5-7 days after the “use by” date. Toss anything that is moldy, slimy, or just looks or smells spoiled. Take a look at your leftovers: generally, leftovers should be kept no longer than 3-5 days. Throw out those that have been there too long. A thorough, deep cleaning should be done monthly. Empty the food out of the refrigerator. In summer months, it may make sense to put some things in a cooler with ice—especially raw meat, fish, cut fruits or vegetables, and leftovers. Take out shelving, drawers, and any other removable parts. Wipe the inside of the empty refrigerator with warm, soapy water, then wipe with clean water to rinse off soap. Dry with a clean towel. If you want to, mix one tablespoon of liquid household bleach (unscented) with a gallon of water and wipe the interior and any shelving with this sanitizing solution. Always clean first, then sanitize. Allow to air dry. Sanitizing alone will not be effective. Finally, as you place items back in the refrigerator, take time to wipe off container surfaces. Wipe off door handles and be sure, if you have a water/ice dispenser on the outside of your fridge, to clean that as well. For more information about safe food preparation and storage check out our website at www.foodsafety.uconn.edu or contact the Home and Garden Education Center at www.ladybug.uconn.edu. I took on food safety as a focus of my Extension programming in the early 1990’s: little did I know that for the next 20-plus years my food safety educator life would be full of surprises. 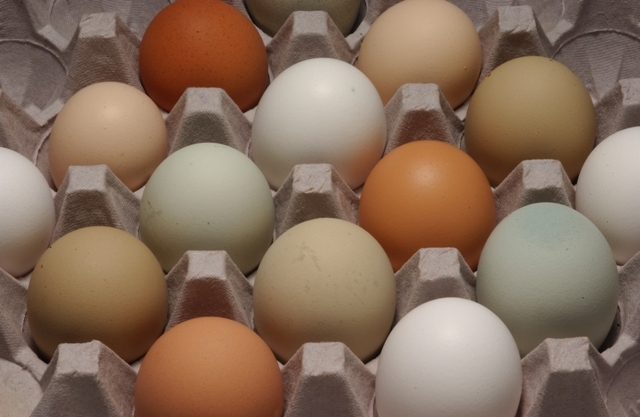 Early on, the issues were what a consumer would expect them to be—salmonella and eggs, salmonella and chicken, seafood as a source of a variety of foodborne illnesses. After all, these are all animal based products, high in protein, low in acid, the perfect breeding ground for the bacteria that cause much foodborne illness. But at the same time, Listeria monocytogenes was an emerging pathogen that would soon become ubiquitous in the food processing industry. We learned that E. coli COULD survive an acid environment such as apple cider. And then came an onslaught of outbreaks related to fresh produce, which heretofore was not considered what were called, potentially hazardous foods or PHF, in the FDA Model Food code. Like all science, the science of food safety is ever evolving. And so too are the unfortunate targets of the microorganisms that cause foodborne illness. Some of the surprises over the years have resulted in additional regulation. The Jack in the Box E. coli outbreak (as well as others), was one driver of the 1996 USDA “Mega-reg” that required all meat and poultry processing plants to develop food safety systems based on HACCP or Hazard Analysis Critical Control Point programs. These programs lay the onus on the industry to identify the food safety hazards that could potentially affect their products and/or processes and to adopt controls to prevent the hazards or at least to minimize the risk of a foodborne illness from these hazards once their product gets into commerce and ultimately the consumer. Similarly, it was a series of outbreaks affecting apple cider, apple juice (Odwalla, 1994) and other fresh juices that resulted in the FDA Fresh Juice HACCP regulation in 2001. The FDA Food Code has also adapted over time as new foods or food processes have added risk to foods that weren’t identified as hazards in previous editions. Currently, seed sprouts, sliced melons, sliced tomatoes, and cut lettuces are all considered time-temperature for control foods (formerly PHF). Each of these were added following outbreaks that affected them. All are low acid foods that support the growth of microorganisms. So, yes, outbreaks can surprise us. Consider some of the food products that have shown up in the news recently. Frozen vegetables: this Listeria outbreak and subsequent recalls affected as many as 350 consumer products sold under 42 brand names. Not an outbreak, but still a hazard—golf balls in hash browns? Pepper and other spices in ready to eat products (coatings on cheese or salami), in spice mixes and simply on their own in a bottle. Sometimes, it is not the outbreak that surprises us, but the extent of the consequences. Raw milk is an example of this. Outbreaks tied to raw milk are not unusual, but a soon to be released report from the Centers for Disease Control indicates that unpasteurized milk and cheese products caused 96% of illnesses attributed to dairy products. This is an important statistic. In several recent outbreaks, including the Peanut Corporation of America and the Jensen Brothers Farm Listeria outbreak in cantaloupe, the owners and some employees of the companies were arrested and given hefty fines, probation, and in some cases, prison sentences. There will always be surprises. In my food safety courses for industry personnel, I use some of these examples as lessons for those who insist that an outbreak or recall will never happen to them. The Food Safety Modernization Act (FSMA) was itself the end result of many surprises. The foods regulated by the FDA are not under as much scrutiny as those regulated by the USDA. Inspections are less frequent. Businesses really do need to take responsibility for the safety of their food as the government agency that oversees them simply does not have the resources to do so. 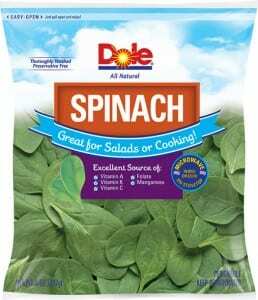 So after a series of outbreaks tied to FDA regulated foods (peanut butter, cheese, spinach, melon, sprouts, pet foods and others) that were not previously required to have a food safety program in place, FSMA was adopted. Included in the regulation were rules addressing fresh produce, processed foods (except those currently under HACCP regulations such as juice and seafood), pet foods and imports. A thriving third party audit industry has also developed as customers of food processors seek greater assurances that the products they are buying are produced under a food safety program. Consumers should simply remain vigilant. Keep up on recalls or outbreaks that affect the foods you eat. If you like to get emails, you can sign up for notifications of recalls on both the FDA site (www.fda.gov) and the USDA Food Safety Inspection Service site (www.fsis.usda.gov). Consider using shopper loyalty cards when your supermarket makes them available. They are often used to contact consumers who may have purchased a product associated with an outbreak or recall. A more reasonable approach may simply to be to learn about how you get sick from food. Learn about the importance of temperature controls, including cooking times and temperatures, keeping cold foods cold, and cooling foods properly. Learn about cross contamination of ready to eat foods with contaminated foods (raw meat), dirty hands or dirty countertops. Don’t eat raw foods that should be cooked for safety (raw, undercooked meat or eggs or doughs for example) and handle ready to eat foods like lettuce and cantaloupe carefully. Follow cooking instructions on the processed foods you buy—especially if you are using a microwave oven. You can learn about how to handle food safely at the UConn Food Safety website (www.foodsafety.uconn.edu) or by visiting www.foodsafety.gov . In other words, take responsibility for the foods that you handle. 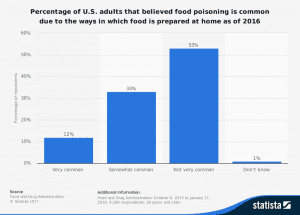 While that may not ensure that you will be forever free from foodborne illness, at least you will be less likely to be the cause of that illness. Eggs, chicken, lettuce, sprouts, and now pistachios. Some readers may think that this association of pistachios with a Salmonellosis outbreak is unusual if not rare. Well, though not likely to be defined as “common,” in recent years a number of outbreaks have been traced to nuts and nut products. Currently, there is an ongoing outbreak associated with pistachios, with the US Food and Drug Administration (FDA) issuing a recall notice on March 10. The brand of the pistachios was the Wonderful brand, but these were also distributed under the Paramount Farms and Trader Joe’s brands, and others. A list of all lot numbers that have been recalled can be found on the FDA web site (www.fda.gov). At this point, eleven people from nine states have been identified as infected with the outbreak strain of Salmonella Montevideo, including one person in Connecticut. Two ill people have been hospitalized. No deaths have been reported. Because the shelf life for these products is long, some may still be on consumer shelves, so be sure to check your pantry for the recalled lot numbers. Salmonella is a foodborne illness causing bacteria that is estimated to cause more than one million foodborne illnesses in the United States, with 19,000 hospitalizations and 450 deaths. Most persons infected with Salmonella develop diarrhea, fever, and abdominal cramps 12 to 72 hours after infection. The illness usually lasts four to seven days, and most persons recover without treatment. However, in some persons, particularly those with compromised immune systems, the elderly and the very young, the diarrhea may be so severe that the patient needs to be hospitalized. There are a many strains or serotypes of the bacteria: S. Montevideo has caused this outbreak. You may be more familiar with S. Enteriditis. Some strains may be more virulent than others, causing more severe symptoms and side effects. Historically, it was thought that nuts were likely too low in moisture to support the growth of foodborne illness causing bacteria. However, researchers have shown now that Salmonella can live on dry products and in peanut butter for as long as six months. There have been 11 outbreaks from nuts and nut products (butters, spreads, “cheese”) since 2010, affecting 169 people. 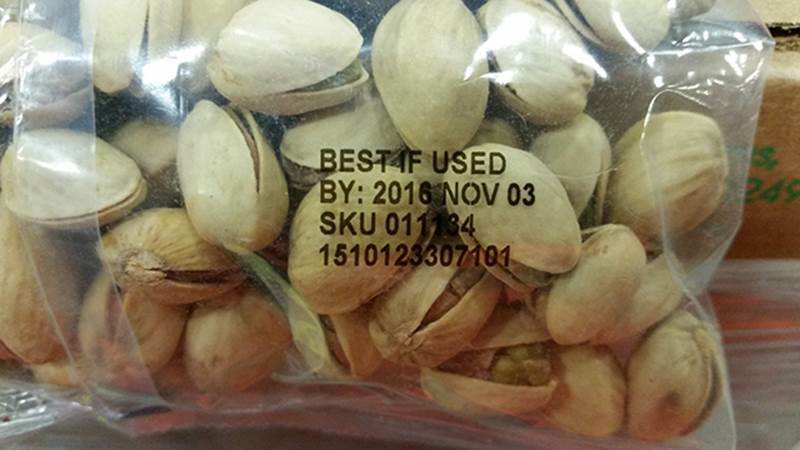 There were 25 recalls of contaminated nut products just in 2015. Recalls are often conducted as a result of a testing program—while a foodborne pathogen may show up during testing, it may not result in widespread illness. And of course, there was the Peanut Corporation of America’s outbreak that resulted in the recall of more than 3,900 products from more than 200 companies, all containing peanut butter or peanut paste from PCA. This outbreak was due to a company that was negligent in its sanitation programs and knowingly shipped contaminated products: four people have been sentenced to prison terms in this case, including the owners of the company, the Parnell brothers. But most cases are not the result of gross mismanagement and fraud. Nuts like any other product grown in orchards and fields can be contaminated by bird poop or irrigation water or during harvest, especially if the nuts come into contact with the ground. This is one reason, after several outbreaks traced back to almonds, in 2007, the USDA Agricultural Marketing Service (AMS) passed a rule that requires all handlers of almonds to use a process, such as pasteurization, that will significantly reduce the presence of Salmonella. In addition, during processing, nuts may be soaked in water to soften shells—if the shells are contaminated, this process could spread the bacteria. And, like any other processed food, a good sanitation program is essential. Otherwise a processor runs the risk of cross-contaminating clean product with dirty surfaces or utensils. Or, Listeria can take up residence in the processing environment, risking the contamination of nuts after they are cooked, roasted, or pasteurized. So, is this something to be concerned about? Well the good news is no, you do not need to be stressed out over your favorite peanut butter. However, if you or a family member is elderly, very young or has an immune system compromised by chronic illness, medications or other condition, then maybe you should steer clear of raw nuts or raw nut butters. The FDA is presently considering conducting a risk assessment for salmonella in tree nuts (almonds, cashews, macadamia nuts, pistachios, walnuts, etc.) as a result of increasing numbers of recalls and outbreaks. The results of this risk assessment may lead to additional regulations, rules, or guidance documents focused on the nut industry. Recently, the Food Safety Modernization Act (FSMA) rules were finalized. This, too, will increase jurisdiction of the FDA over both growers and processors of nuts and nut products. The Produce Safety Rule will address what goes on in the field; the Prevention and Controls Rule will impact processing operations. Attention is drawn to safer irrigation methods, worker health and hygiene (important during harvest), sanitation in the field and in the packinghouse. Regular inspections of farms and processing plants will be part of the new regulations. Minimize contact with ground during harvest. Consider covering the ground with a CLEAN tarp or sheet to catch the nuts. Handle harvested nuts with clean hands. Always wash surfaces that come into contact with harvested nuts—counters, table tops, etc. When opening raw nuts, be sure to use clean hands and utensils. Dry/cure nuts completely before storage—again using clean equipment. Store nuts in a clean container. Freezing or refrigerating will further reduce the risk of bacterial growth. For more information on growing and the safe handling of nuts, contact the Home and Garden Education Center at ladybug@uconn.edu or 1-877-486-6271.